Break every record in the fastest-ever Formula 1 cars. Codemaster's critically-acclaimed F1 series returns for the 2017 season sporting a range of exciting new features which push the signature high-octane action even further. With a roster of cars that reflect the latest advances in modern motorsport, set record-breaking laps around some of the world's most famous Grand Prix circuits and go nose-to-fin with some of sport's most celebrated competitors in the 2017 World Championship. Become a legend of the circuit in a re-tuned 10-year Career Mode featuring more varied gameplay, a new ‘Championships’ mode, a new range of classic motors and a host of other new features, both online and offline. Put yourself behind the wheel of world’s fast production cars and go all out for your club in Driveclub VR, exclusive to PSVR. 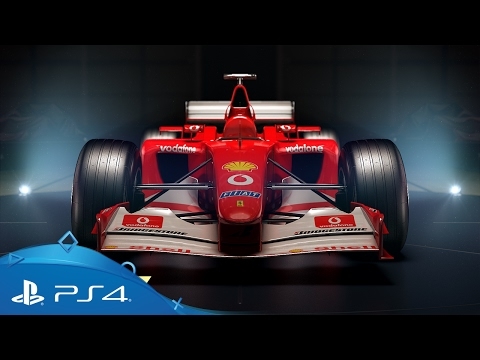 F1 2017 Game - an official product of the FIA FORMULA ONE WORLD CHAMPIONSHIP. © 2017 The Codemasters Software Company Limited ('Codemasters'). All rights reserved. 'Codemasters”®, “EGO”® and the Codemasters logo are registered trade marks owned by Codemasters.